(Nanowerk News) Under the direction of the Fraunhofer FEP, an in-house Fraunhofer project for development of biodegradable electronics was begun last year. The Fraunhofer Institutes ENAS, IBMT, ISC, and the Fraunhofer Project Group IWKS are working together on the project. First results of the Fraunhofer FEP will be presented during Semicon Europe 2017 as part of productronica 2017 in Munich at the Silicon-Saxony joint booth in Hall B, Booth No. B1-416, November 14-17, 2017. Electronic devices that are completely broken down in a biological environment after a pre-defined operating life open up novel applications as well as ways for reducing their ecological footprint. One enabling technology for such devices is the production of biodegradable conductive traces on biodegradable substrates using vacuum technologies. 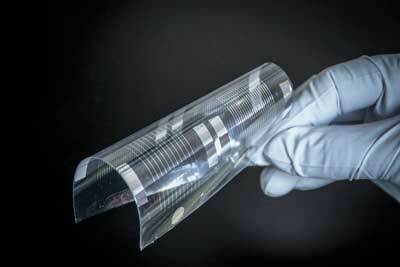 This technology was developed by Fraunhofer FEP. Conductor structures and organic thin-film transistors are being developed at Fraunhofer FEP using vacuum technology. Deposition of magnesium via thermal evaporation under high vacuum conditions is being used as an enabling technology for this purpose. Magnesium is known for being a biodegradable and biologically compatible metal that is already employed in clinical environments as an absorbable implant material. The challenge consists of depositing this metal onto biodegradable polymer films that magnesium does not adhere sufficiently to under normal processing conditions. By suitably pre-treating the substrates using a combination of drying, plasma treatment, and utilization of seed layers, finely structured high-quality conductor structures have been produced.